Soooo... Things were really cooking along great on the programming front for a few years. After a fun and relatively successful (however one might define that) run in VB.NET tutorials focusing originally on game design, and later on, primarily on database connectivity and general VB.NET topics with VBTOOLBOX, I decided that it was high time to follow my dream of moving to the tropics. Sounds pretty paradisey, right??? Hah! It's is nice, but my lifestyle has been completely upended. Hardly a sob story, but my path has been extremely challenging. I went from being gainfully employed, to literally figuring out how to make my $0.56 bank account stretch for three months. Currently, I'm living off the grid with two batteries, four solar panels, and extremely poor internet. Couple that with the fact that my coding machines are broken or damaged and my electrical limitations, code work is extremely challenging. Add to that the fact that there is no incentive from YouTube for video production anymore, as I've been informed that my content is too "small potatoes" and will be demonetized. I have finally found employment to help get me afloat again, but I won't see stability of any kind for at least a year, unless I can figure out a secondary means of income, or some long lost uncle wills me a gazillion dollars. Har har. Until I get a life, I won't be producing much in the way of VB.NET programming content, as I'm currently running on a Raspberry Pi 3 to save on power. I am picking up a little Python, however. I've had many requests of late for my archived XNA projects, so I added the to the Tutorial & Project Source Code page (on the left). Much of the original XNA tutorial source is unavailable as it resided on my dead laptop and old web server. I added a couple copies from the inventory videos and animation testing. You're welcome to do as you wish with the projects, but please understand that I'm not in a position to support or assist with these old projects. Sorry! Best I can do is direct you to the old tutorials in hopes that you'll better understand what you're working with. Unfortunately, the complexity of the new hardware and pitiful connection coupled with the much increased ISP costs in my new location has dissuaded me from hooking the old beast back up. It held up really well for many, many years! I had no idea that the site and its small trove of ancient tutorial files hosted on that box was in such high demand until I took it down. I'm constantly hit with questions about why my site is down and requests for those old project files, so I figured that it was high time to, at the very least, reestablish my web presence. Additionally, I'm hoping that this will provide a medium or community for interaction and commentary between myself and my viewers. Why not set up a fresh web server? Well, I plan to be relocating, yet again, this summer. Where I'm headed, I have no idea what I will be doing or whether I'll even be able to continue doing tutorials. For my most recent tutorials on the VB Toolbox I've been relying heavily upon Dropbox for project source code sharing. I figure that I can continue to use that throughout my transition without fear of interruption in file distribution. Yay! 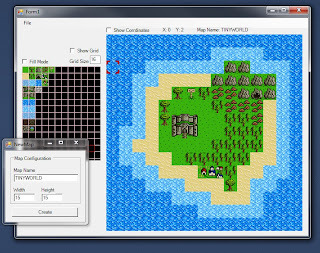 Working on a "simple" map editor for the AIX series. Still need to make it pure XNA. Presently it's a GDI/XNA hybrid eww. Still have a long ways to go. 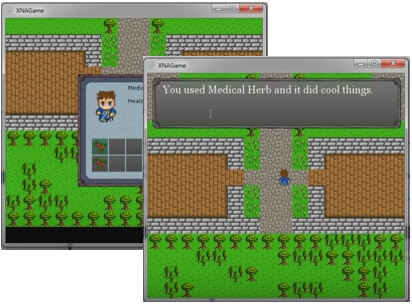 I'm back - finally - and trying to get my new tutorial series "Adventures in XNA" off the ground. 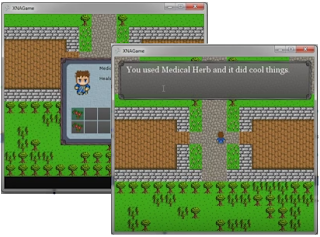 After playing with XNA a bit, and with a tremendous amount of help from Kalamus1, we've greatly refined the process of setting up an XNA game, movement and animation cycles, managing game screens, and much more. You can follow the new series on YouTube! Rad Marvin takes a leisurely stroll through TinyWorld and finds a sign post whilst groovin' to some new tunes thanks to the addition of a new sound class.